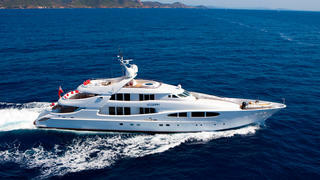 The 47.6 metre motor yacht Big Mak has changed central agencies and is now listed for sale by Yachtzoo. Designed by Frank Mulder, Big Mak was built in aluminium to ABS class by Dutch yard Heesen Yachts and delivered in 1998 with an extensive refit in 2014. Formerly known as Blowzy, she accommodates 10 guests in five cabins including a full beam master suite on the main deck. Below are two doubles and two twins, all with Samsung television screens and en suite bathroom facilities. In addition, there are quarters for nine crew in four cabins. She features fresh, elegant interior styling using natural woods, light stone, white furnishings and floor-to-ceiling windows to amplify the impression of light and space throughout. The main saloon, sky lounge and dining room offer several stylish areas for entertaining or relaxing while spacious decks provide plenty of options for lounging. The saloon has U-shaped seating around a long, low table and faces an entertainment centre including 32 inch HD television screen and a stereo surround sound system. Al fresco dining is available on the large aft deck while the sun deck offers ample sun pads, a bar, fridge, barbecue grill, dining table and a hot tub. The spiral staircase on this yacht for sale is a wonderful feature, with a skylight pouring natural light down and through each deck to increase the sense of space and openness. Powered by twin 3,700hp MTU engines, Big Mak has a cruising speed of 18 knots and a range of 1,000 nautical miles. She is fitted with zero speed stabilisers. Lying in Malta, Big Mak is asking €7.9 million.